Born in Nantes, France, Évariste Vital Luminais went to Paris at the age of 18 to study with the painter and sculptor Auguste-Hyacinthe Debay. He later trained under Léon Cogniet and, formatively, with the animal and landscape painter Constant Troyon. 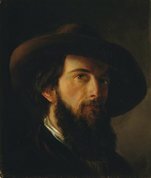 His successful career as an academic painter of genre and historical themes began when he first exhibited at the Paris Salon in 1843. He was awarded the Légion d’Honneur in 1869, by which time he had also abandoned Breton peasant subjects in favour of ambitious compositions which recreated scenes from early French history, notably the period stretching from pre-Christian Gaul to the early Middle Ages. In France, Luminais became renowned as ‘le peintre des Gaulois’, although he also illustrated scenes from the era of the Merovingian kings, who ruled France from the fifth to the eighth centuries. When his large-scale canvas, The sons of Clovis II , inspired by the legend of two hamstrung Merovingian princes, was exhibited at the Salon of 1880, it caused much interest and was soon afterwards purchased by the Art Gallery of New South Wales as a sensational example of contemporary art. The Gallery’s watercolour – known as The Merovingians or Gallic horsemen – depicts a group of warriors crossing a marsh on horseback, the figures conforming to Luminais’ standard way of depicting the Gauls, with long red hair, helmets, bare torsos, and usually carrying shields and arrows. The foreground figure appears to be exhorting the warriors to combat by blowing his horn. As an academic painter, Luminais planned his canvases with great rigour by making exhaustive preparatory figure and compositional studies in chalk or watercolour. The Gallery’s work can generally be related to the artist’s paintings of fighting and marauding Gauls from the 1870s, but it appears not to have been worked up into a finished oil. 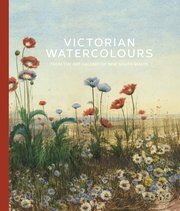 Although watercolour was practised with increasing regularity in France during the second half of the 19th century, compared to their British counterparts, artists took to the medium in significantly fewer numbers, and those who did tended to use it for preparatory work and study rather than for finished works of art. Despite the efforts of the Société d’aquarellistes français (Society of French Watercolourists), which was established in Paris in 1879, the medium never attained the overwhelming popularity it enjoyed on the other side of the English Channel.